The Vienna Philharmonic needs little introduction, and so it was without introduction that the musicians took the stage in Zellerbach Hall Friday night. The sudden flow of musicians onto the stage was followed by the entrance of guest conductor Semyon Bychkov. Likewise without introduction, the maestro strode onstage and confidently faced the audience for a brief moment before turning to his orchestra and beginning to conduct. 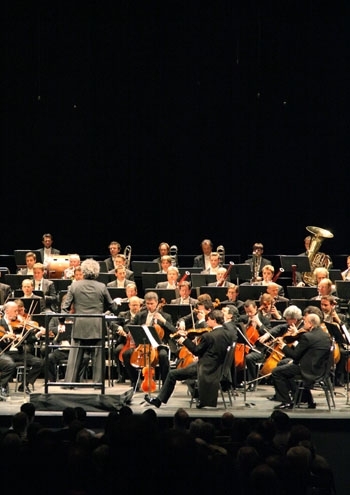 Cal Performances hosted the world-renowned orchestra last weekend for three performances. It's hard to know what to say about the Vienna Philharmonic aside from what everyone expects you to say - which is the truth. That being: The Vienna Philharmonic is fantastic. Friday night's program opened with Schubert's Symphony No. 2 in B flat major. Bychkov's style as a conductor soon revealed itself to be emotive but precise - his motions effused a clarity of purpose that was matched by the pure sound of the Vienna strings. From Schubert, the performance ventured forward in the history of Western music to Richard Wagner's swelling prelude from the opera "Tristan und Isolde." In the midst of the romantics of "Tristan," the visual spectacle of the orchestra became art in its own right; the stage, awash in the warm wood of so many instruments, rocked with the sway of so many bodies and the rise and fall of so many bows. Bela Bartok's "The Miraculous Mandarin" was the final number. The Hungarian composer's suite, taken from his bizarre ballet of the same name, worked as a foil to the previous piece. Where Wagner's "Tristan" embellishes a story of forbidden love that finds resolution only in death, "Mandarin" is a fraught tale of the mad pursuit of a somewhat-unwilling woman. The music is intense and distraught, explosive in juxtaposition with the rest of the repertoire. The Bartok piece allowed the program to step away from the Schubert-Wagner Germanism and embrace Eastern European influence - a quality which resonates especially under the hand of conductor Bychkov, a Russian-American born in Leningrad. The Eastern European folk music flavor continued into the encores, which were comprised of Brahms' Hungarian Dances No. 1 and No. 5 in G minor and Czech composer Antonin Dvorak's Slavonic Dances. The entire program was rooted in history - after all, Vienna Phil played a role in the initial popularizing of the works of Schubert and Wagner. Saturday and Sunday night, the orchestra went on to perform Schumann, Brahms and Mahler, whose compositions all have similar historical significance. In the end, the music speaks for itself. The range of Friday night's program, from Schubert to the Slavonic Dances, was drawn from a period when music, as well as the world, was truly transforming. These pieces (intentionally or otherwise) articulated the strange beauty of the old world's confluence with the new. It's harder for a contemporary audience to ignore that the number of women on stage was relatively small. The gender ratio seems an uneasy relic from the not-so-distant past - and an affirmation that artistic legacy also comes with less appealing ghosts of cultural memory. Nevertheless, the very fact that there were women on stage, and even the fact that the Vienna Philharmonic can fill a Berkeley venue, indicates a world apart from Wagner's or Bartok's, albeit one in which their music is still relevant.